Scrap is no longer maintained on WoWInterface. For the latest release, check Curse. If you wish to translate Scrap to another language, fell free to use this localization tool. And please consider supporting Scrap with a donation. This is the last version of Scrap to be uploaded here at WoWInterface. For now on, Scrap will only be available at Curse.com (http://wow.curse.com/downloads/wow-addons/details/scrap.aspx). Added compatibility to Scrap's new plugin: Scrap Cleaner! Went back to the old options dropdown. Without the junk lists option, the window does not make much sense. Added new "blizzard-style" tutorials. Stop pressing F3! Junk lists are now saved per-character (old global profiles will be kept for now, so this change is reversible). If you wish to have profiles, use Reflux. As the junk lists are saved per-character, most of the window's space is empty. Ideas for new options are welcome. Scrap is going trough a "transitional phase": there are many upcoming changes, which will make Scrap profiles from previous versions incompatible with the new version. An additional addon, Scrap BetaUpdater, has been included, which will make the transition of enUS profiles a smooth process, but users with other clients may find transitioning their junk lists a difficult process. Our apologies, but this will be better for the users on a long term. Added a new module: Scrap Merchant, which will make the Scrap merchant button load on demand. What does this means? Faster loading and less use of memory and cpu on startup. Now Scrap does not allows items which can't be sold to the merchant to be added to the junk lists. Scrap no longer has a 'module API'. Combuctor Scrap and Baggins Scrap now 'hook' Scrap to work properly. Before you start asking, this is still not the version which includes the library I've been working for the last year. That will be a closed beta. Hey, I love Scrap! It is the best functioning junk seller I've come across. The only thing I miss from other--lesser--addons is the ability to print a sales report to chat. A simple line with item sold, and for how much. Possibly a toggle for coin or text currency values would be nice. Of the four options in this addon, only three of them are available for me to place a check mark for. I am unable to select "Low Equipment". I can select and change all other options except for that one. I would love to be able to use it since I'm doing Loremaster and getting all these low level quest rewards that I can't really do anything with. Any help on getting this option to be selectable? Yes, I read the tutorial... it says "You can specify which items you want Scrap to sell or not: to add or remove an item from your Junk List, drag it from your bags into the Scrap button." So here is a recap, the tutorial which I keep getting referred to has only two pages, which only instruct on the Junk List. There is no intiutive way to access the Not Junk List. There is a button on the Not Junk List in the visualizer, that says "Add to Junk List" that is always greyed out because the list is empty, but that tells me there is a way to add to this list, but I dont understand how to get an item on there. Simple: it's the same list. You can either set an item as "not junk" or "junk" by dragging it into the Scrap button (forget the Visualizer for god sake). The Visualizer only displays the items that do not match the default settings, because loading 80K items would be crazy. Think less, let the addon think for you. Just drag and relax. Last edited by jaliborc : 05-14-11 at 04:47 PM. Because you have selected no item in the Scrap Visualizer to be removed from your "Not Junk" personal list (by other words, adding it back). The Visualizer is just an auxiliary tool: drag items to the Scrap button to add or remove them, just like the tutorials say. the in game tut is only 2 pages big (atleast I only have 2 pages) and when I drag stuff over the button, it only adds it to the junk list. Its just if you click an item on the scrap button, it adds it to the junk list, the "Not Junk" list add button is always grayed out. 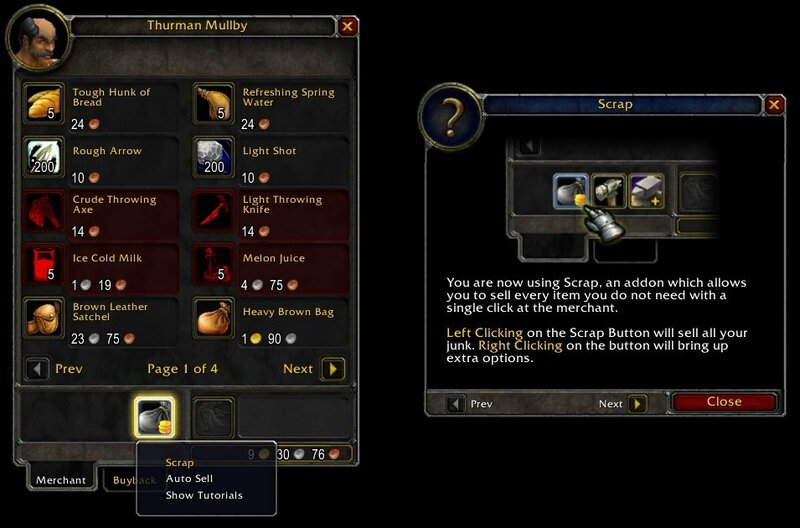 Drag an item from the bags into the Scrap button. If you have any doubts, why not following the in-game tutorials? They explain that carefully. Any consumable with less 15 levels than your current one. Remove it from the junk list if you want it. That's why the any is bolded red. I cant figure out how to add things to the "Not Junk List" The Add to Junk List button is always grayed out, and there doesnt seem to be any way to add my Shiny Baubles to the list. Has the auto sell functionality of Scrap changed recently? It no longer seems to be automatically selling BoP weapons and armor of unusable types on non-enchanting characters. No, it should be selling those items. Gonna check it out tough. I just can't access the options.I tried /scrap options, /scrap config but nothing..
Also I drag an item to the icon in order to add it in the junk list but it doesn't work, it does not sell it after that, even with a reloadUI. 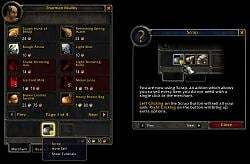 This addon seem very promising..
other addons are just LUI, onebank3,onebag3,Deadly boss mods and Atlasloot. LUI has only bartender and Ouf Unit frames..
As you see I am clean of unnecessary addons, still cannot make scrap seller work. 1: There are no slash commands (I hate slash commands!). Right click to access the options. 6: Thank you for the feedback! Last edited by jaliborc : 12-06-10 at 08:36 AM. I use Scrap and as far as I get it, then ArkInventory should use whatever non-trash I define as Trash on Scrap as Trash in ArkInventory and place the items in the Trash-rule I've made? Talk to ArkInventory author. It's his feature, not mine, and I didn't event knew it existed. Tutorials work, and I'm not removing them (does it even make sense, to remove features?!). The list may be (must be! ) implemented eventually, but not how you imagine it... much better. Last edited by jaliborc : 12-04-10 at 05:16 AM. Basically, I add that check last version to prevent more unpleasant bugs from that strange "delay". I don't know were is it coming from, but, when it happens, (if it was not for the check) Scrap could behave in very strange ways, some of them irreversible. I am having this issue to. No other errors are being thrown... Auto sell just doesn't auto sell any longer.